Marion-Perry County 200 Alabama Bicentennial Celebration Jazz on the Square Marion, AL hosts third Jazz on the Square. Happy 200th Birthday Perry County! 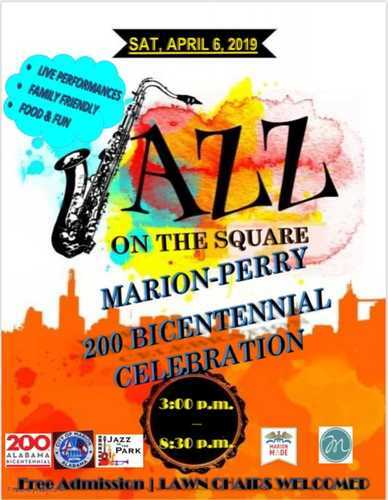 The Marion-Perry County Bicentennial Committee, the City of Marion, and Main Street Marion invite you to attend the Marion-Perry County Bicentennial Celebration with Jazz on the Square which will be held on Saturday, April 21st from 2:00 p.m. til 8:30 p.m. This event is FREE to the public and will include live music, storytelling, a special art gallery opening, fun kids’ activities, along with food and local vendors. All are encouraged to come down, bring a lawn chair, and enjoy downtown Marion on our historic Courthouse Square. The opening ceremony will begin at 2:00 p.m. closely followed by a day full music and storytelling. Local performances include First Impressions, Marion Military Institute, as well as stories told by Mrs. Eleanor Drake culminating in another great performance by Magic City Smooth Jazz. Cooper Holmes, Chairman of the Marion Bicentennial Committee, stated, “We want to make everyone from every part of the community feel welcome at this event and we [the Marion-Perry County Bicentennial Committee] have been busy working together so that we can all celebrate the people of Perry County on our 200th birthday. The number one thing you can do to help is invite your friends to what promises to be a fun day filled with great music.” Again, all are welcome at the second annual Jazz on the Square Saturday, April 21st from 2:00 p.m. til 8:30 p.m. on the Marion Courthouse Square. If you have any questions contact Marion City hall at (334) 683-6545 or contact the Main Street Marion office at 334-607-5066 or by email at MainStreetMarionAL@gmail.com. You can also call Susan Passmore, Marion Bicentennial Committee and Main Street Design Committee at 404-245-7575 if you have any questions. *Interested vendors are encouraged to contact Marion City Hall at (334) 683-6545 and note that local vendors will be prioritized, but due to limited space, that there may already be a waitlist. 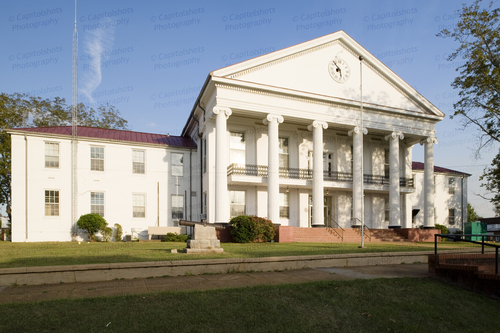 Marion is located in the Cahaba & Oakmulgee Region of Central Alabama. Be sure to check out places to Go, Eat, Stay, and other events in Marion.